Mr. Murphy has served in a number of critical leadership positions within CBP. He retired with 30 years of government service on September 25, 2013. He has served in the Senior Executive Service since 2006 when he was selected as the Director, Field Operations, Chicago Field Office. In this capacity, he was responsible for all Office of Field Operations activities in a 12 state Midwest region. He supervised a workforce of approximately 1,100 employees, 40 offices, 23 Port Director and 4 Area Port Directors and his managerial oversight included all international arrivals in airport and seaport environments, including airports at Chicago O’Hare, Minneapolis-St. Paul, Cleveland, Cincinnati and St. Louis, as well as three largest express consignment operations in the United States (DHL, UPS and FedEx). While in Chicago he hosted his own live weekly public television show on CBP, the first of its kind in the nation. Mr. Murphy began his career in San Diego as a Customs Inspector in 1983 and later took a different path in 1986 when he transferred over to the Canine Program where he spent the next 14 years as canine officer, team leader, supervisor and acting chief of one of the largest and most successful canine programs in the nation. He was then tapped to head up enforcement efforts for the entire San Diego Field Office and in 2001 was named as the Assistant Port Director in San Ysidro, the largest and busiest land border in the world. 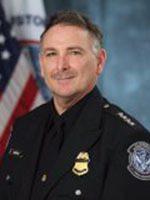 In 2003, he was promoted to the position of Assistant Director, Border Security in the San Diego Field Office from 2003 to 2006 where he was responsible for overall operational activities in the Southern California area ports of entry. He later Served as the Port Director at San Ysidro before his departure as Director in Chicago. Mr. Murphy has also served in several national security roles as both an Incident Commander and Lead Field Coordinator, including the Red River floods in 2009 and the 2012 Super Bowl and the G8 and NATO conference in Chicago in 2012 and as the first Deputy Director of the SBI program office at CBP. For the last year and a half Mr. Murphy has been called upon to serve in some of the top leadership positions within CBP and the Office of Field Operations as Executive Director of Operations, Deputy Assistant Commissioner and Assistant Commissioner overseeing 29,000 personnel and a 4 billion dollar budget. He assisted in the efforts to expand preclearance in Abu Dhabi, the 560 public/private partnership initiative and the “Workload Staffing Model” for the Office of Field Operations. ​Mr. Murphy received a Bachelor of Arts degree in History from the University of San Diego. He is also a graduate of the Harvard Kennedy School of Government “Senior Managers in Government” program and a Harvard fellow. In addition, he served as a mentor for the Customs Leadership Institute at the University of Chicago, Booth School of Business.